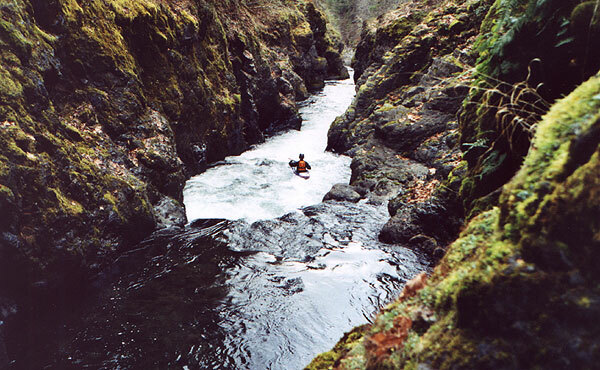 The Table Rock Fork of the Mollala has a short, difficult section that contains several perilously narrow rapids running between steep, rocky walls. This gorge waits just below the excellent class III-IV main run on the Table Rock Fork and can be viewed from the road on the way to the put in for that run. Recently Pete and I were in the area when I decided to make a quick solo run through the gorge. Pete had done it before, but I never had so I figured I would take the opportunity. Pete didn't have his boat, so he agreed to take photos from the top of the gorge. 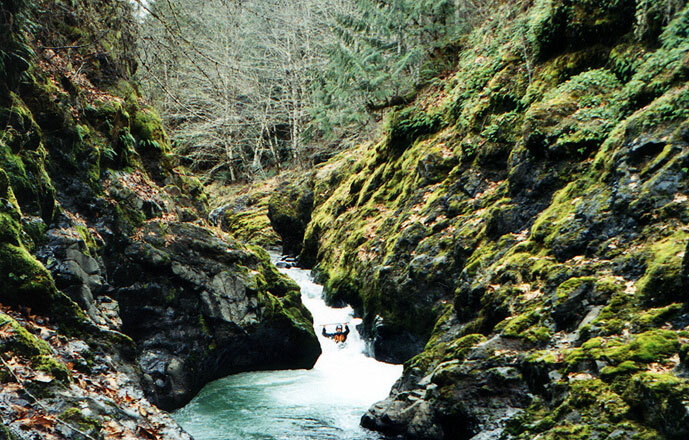 When John and Dan entered the gorge they scouted the first rapid (which has since come to be known as "Dan's Den"). 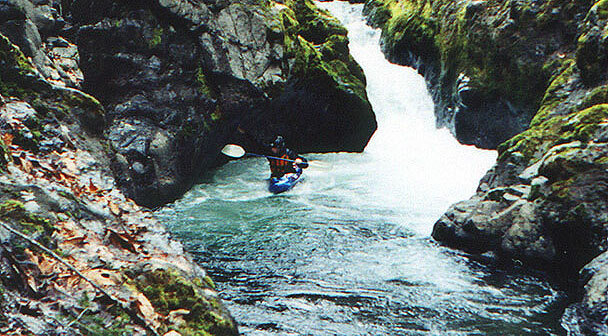 This rapid culminates in a dangerously narrow boulder choker that is difficult to navigate safely at any flow. While John portaged Dan ran the right side and was vertically pinned in the bottom drop for awhile before finally managing to free himself and run the rest of the gorge without troubles. 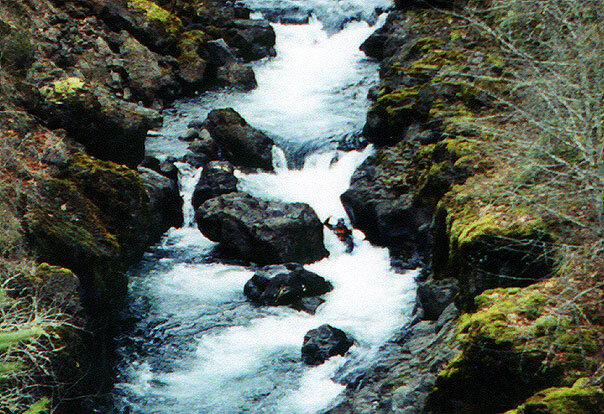 Dan's Den is one of two demanding rapids in the gorge that become harder with more water. When the gauge on the Mollala is reading above 700 cfs these drops begin to assume a class V nature as the hydraulics get vicious and and the narrow nature of the gorge begin to present severe hazards for swimmers as rescue options are limited. The Author makes good use of his elbow pads as he careens through through the left side slot at Dan's Den. At flows over 600 cfs the hydraulic in this slot becomes prohibitively hazardous, forcing a run through the even narrower river right side slot, which is loaded with pinning potential. Below Dans Den, looking up into the right side slot, which becomes 'runnable' at flows over 600 cfs. 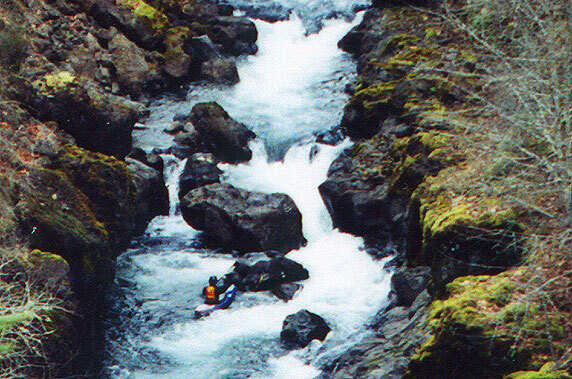 Below Dan's the gorge mellows but quickly the rapids again increase in difficulty until you reach the second, most challenging drop. This rapid is unmistakable from above, and I highly recommend getting out on the right and scouting this one carefully from the walls above. Due to the steepness of the walls the first boater through this slot has few options if something goes wrong- there is nowhere to set up a rope! Boaters that follow may be able to receive assistance from paddlers in the 'room', but don't count on it! Boofing over the hole below the narrow six foot pourover in the middle of the gorge. This is the crux rapid at lower flows, and if you end up in the hole rescue options are limited. Wouldn't want to be upside down or swimming in here! Up against the undercut wall in the 'room'. Below this last drop the gorge mellows out and the last two hundred yards is pretty easy with some very nice scenery. Flows: The photos on this site were taken when the river was running around 200 cfs. At this flow the gorge is technical class IV. At higher flows the hydraulics get very dangerous and running this gorge is a solid class V undertaking for experts only after careful scouting. Class: IV - V, difficulty varies dramatically with levels. Character: Narrow, scenic gorge with demanding drops that are hard to scout and harder to portage. Access: Follow the directions to the put in bridge on the Lower Table Rock Fork run in Soggy Sneakers. From the newly improved campground, take a left where the road forks and drive up the Table Rock Fork. A half mile above here the trees open up and you can get out to scout Dan's Den from a hundred feet up on the rim of the gorge. It is also strongly recommended that you scout the drop just downstream by bushwhacking for about a hundred yards in through the trees.